The current OSR topic of the week appears to be monster books. Which is one of my favorite topics and just for once I’m not a month late to the part. Just a day earlier, a new monster from Joseph at Against the Wicked City had me motivated to put a lot more effort into my own monsters. I9 got things like tar demons, giant hypnotic butterflies, and psychic flying tentacle monsters and there’s a lot more potential in them than just a stat block with hit points, damage, and perhaps two or three spells. And I am in agreement with the other writers who think that this is basically all that common RPG monster books provide. I think that’s a general problem with RPG material, not just monster books but also campaign settings and adventures, and it has been so for a very long time. 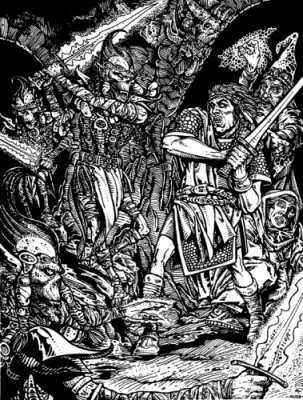 A question that you see brought up a lot these days, and very prominently and deservedly by Bryce at tenfootpole, is “how does this help a GM to run a game”? I think I am probably speaking for every fan of monster books in saying that what we are looking for are not stats and new mechanics. 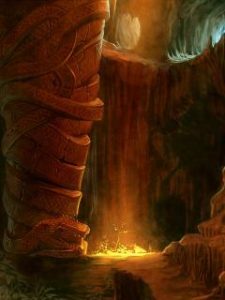 What we hope to find in such books are ideas to turn into great adventures and encounters that are thrilling and fascinating to the players. I wouldn’t go as far as noism and say that I’d be happy with a book that is nothing but pictures, but I can see where he is coming from. Monster art always has a huge impact for me, often considerably greater than the stats and the actual description text you get in most books. And I think D&D and all it’s descendants have been doing it wrong from the very start. I don’t blame the first Monster Manual, as it was a completely new thing and creators still had to learn what works and what doesn’t by trial and error. But shortly after we got the Fiend Folio, which could teach us a lesson that has still been largely ignored to this very day. Most art in monster books is very much resembling zoological species identification guides. You get the creature from a front angle or slightly from the side, in a position that is at rest or ready to attack, with a focus on making it very easy to see its anatomy and all its distinguishing physiological features. Its a precise way to give the reader a good view at how the creature looks. But it’s also very boring and doesn’t really tell you anything about what the creature does, how it behaves, and in what situation the players might encounter it. The FF had images of this type for every creature, but it also had a lot of pictures showing some of the creatures in a fight with adventurers. And these action shots are always making the respective creatures so much more interesting than the portraits. I assume that the intention is that the illustration of each creature is as generic as possible to allow GMs to imagine it in whatever environment and situation is appropriate for it in their respective campaigns, and this might also go for the description text. But I don’t think it works this way. As I said above, the most useful presentation of a monster is something that inspires encounters and adventures based around the creature. That is what we pay for. Not a block of stats and abilities to be a moderate challenge for a group of four 15th level characters. Action shots are probably more expensive than portraits since the artist has to paint at least twice as much space and its much more complex work to get the full composition of creatures and environment right. But as I see it, it would be worth it. I gladly pay a bit more for monster books that inspire me by giving me ideas that I can work with. I buy the monster books that are around because there’s nothing else to get, but I almost always feel disappointed by them. Showing the creatures in action, in a context that suggests situations to steal for my own campaign, would be a good step forward. It requires much more effort from the writers, but that’s after all what I am paying for. Imagine a monster book with descriptions like those of Joseph and proper action shots for each creature. A book like that would easily blow everything else out of the water. You write, “the most useful presentation of a monster is something that inspires encounters and adventures based around the creature” – and I agree. But then you go on to say that you want art to show “the creatures in action, in a context that suggests situations to steal for my own campaign” and I’m not so sure about that. I guess I don’t study the images carefully. I fear an action shot would just prove input for a tactical setup: darkness, ledges, two dogs, snow, moon, lake side, campfire… I don’t know. Those are not the things I’m looking for. I’m looking for “these are the spells the Jinn will teach you” and “orcs will use boars to guard their villages”. I think the focus is not on the scene but on the background. I don’t care about Modron military organization, but I do care about a typical unit my party would encounter, and I’d love to hear what they might be thinking and saying. 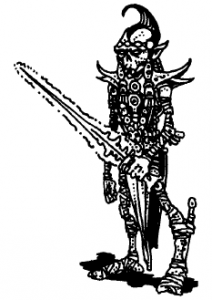 Are the bugbears willing scouts of the dark elves? Apparently they are! I find good illustrations highly inspiring for getting a feel for scenes in which a creature could appear. It’s not just the setup of an encounter, but the atmosphere of the situation. Of course, since a creature has many different possible uses, having several very different scenes shown would be ideal, but that’s of course not realistically doable. But to me even a single specific action shot is still more evocative than a portrait on blank background.